In her work, Paris-based artist and photographer Corinne Mariaud questions the image of women and their place in our contemporary society. The resistance of the individual, the diktat of appearance and clichés about femininity and masculinity are at the center of her photographic reflection. The “Disorder” series questions the relationship between the individual and the urban environment. 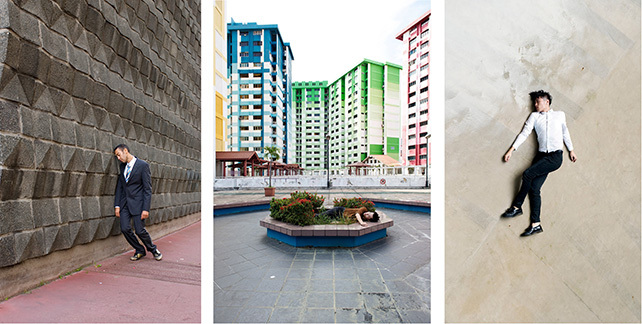 Human bodies lie on the ground, sliding on urban matter. Within these images, people are stuck. Immobilized. Caught in the rigidity of the environment. As trees or fragments of green spaces are contained by architecture, man is framed by urban material. Characters seem anonymous, fragile bodies of a big commonness. However, by the strangeness of their postures, they uproot of the usual order of things. Organic and corrosive, the supple bodies interrupt the geometric patterns of the image. The work of the artist thus expresses a kind of solitude, where the norm is not reassuring but constrains the individual to a form of violence towards him/herself.